Looks like the Twitter app. Sparrow is a new app that is selling like hot cakes in the Mac App Store.At $9.99, it’s the #1 paid app in the US, France, Germany, the UK and many other countries. What does it do? 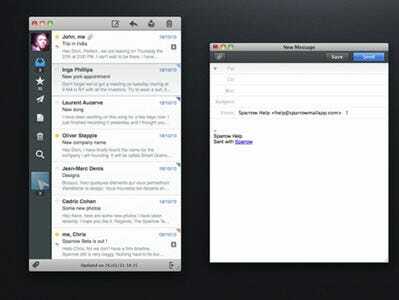 It’s an email client for Gmail users. Wait a second, why pay $10 when Gmail is free to access anywhere? Well, the app’s clean and beautiful design is attracting thousands of users despite the price tag. This struck us as an impressive thing to pull off, so we got on the phone with Dom Leca, Sparrow‘s founder and CEO, to find out what makes Sparrow special. As Leca himself said, the app’s current ranking doesn’t necessarily mean they’re going to be huge, as they just launched and are getting a neat spike. They’ve been working on this app for months. Specifically, they put out a beta last October, which was downloaded 200,000 times, and spent every day since fixing bugs and adding features in response to government feedback. It’s this fine-tuning with constant user feedback that let Luca know he had a hit on his hands by the time he wanted to submit the app to the Mac App Store. Sparrow is actually a full-fledged mail engine, not just a mail client. The Mac client is really more of a proof of concept. Leca and his co-founder have been working on the engine for a very long time. The only big mail engines out there, built and maintained by companies like Apple, Google and Microsoft, are old and have plenty of legacy features that make them really slow. So it’s worth building a mail engine from scratch again. For their next trick, they’d like to do an iPad app, but are afraid it will be rejected because the iPad already has a native email app. 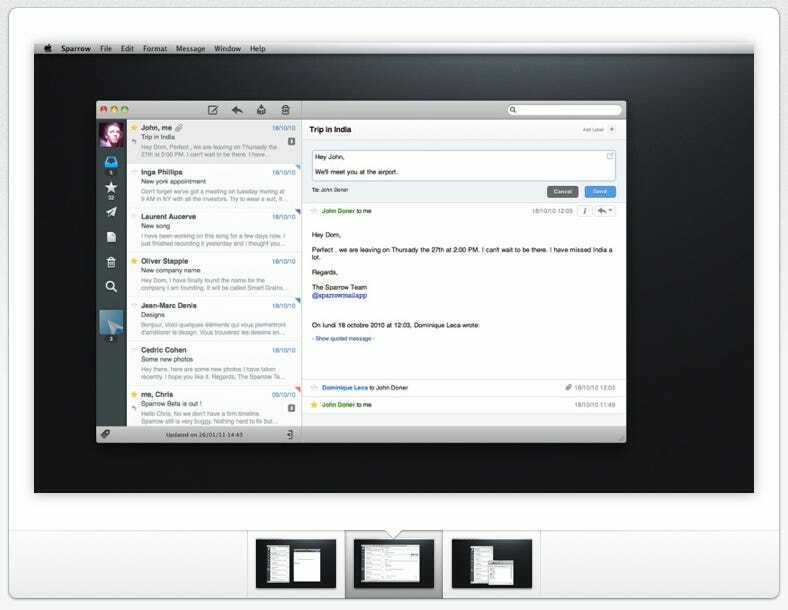 So does the Mac, but Apple would “kill its ecosystem” if it didn’t let mail apps into its Mac app store, Leca said. Before Sparrow, Leca and his team were iPhone and iPad developers, so he knows from experience that even if someone at Apple says your app is fine, it doesn’t mean it won’t be rejected. The app was approved at 2am this Tuesday and Leca sent “like 20 emails” and the app took off. Being featured on Daring Fireball and TechCrunch wouldn’t hurt. Interestingly, Leca told us that TechCrunch got him plenty of emails from potential investors, but few downloads. But Sparrow already has investors in hyperactive global superangel fund Kima Ventures. Leca wouldn’t talk download numbers but said that the app has already generated “tens of thousands of euros” in revenues. Given that after Apple’s cut Sparrow keeps roughly 4 euros per download, do your own maths. Either way, it’s not bad for two days.